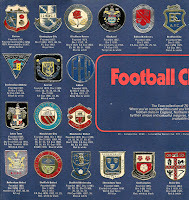 Football club badges somehow seemed to matter more in previous decades. Pick up any book or magazine and they were everywhere, as if it was your duty as a young child to memorise and appreciate the graphic identity of every team. 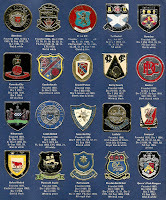 This was never more apparent than in The Esso Collection of Football Club Badges from 1972. Esso had already achieved incredible success with the now-famous England World Cup Coin Collection of 1970 but were keen to reinforce their position as the favoured petrol supplier for English fans everywhere. 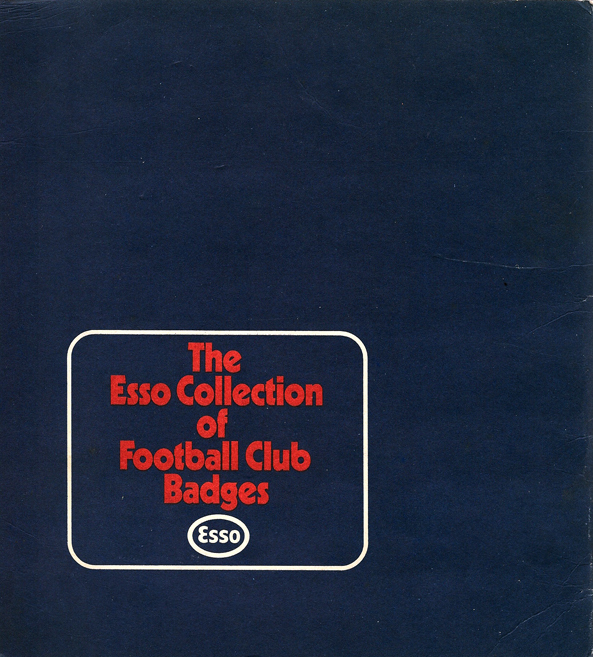 As part of their ongoing connection with the world of football, Esso came up with a scheme whereby drivers could claim a free foil badge featuring any one of 76 clubs from England, Scotland, Wales and Northern Ireland with every four gallons of petrol. 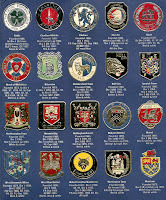 There was a special board on which to mount your badges, and if you were in a hurry to complete your collection, there was also a starter pack of 20 badges available, reasonably priced at just 20p. Once again, Esso had hit upon the winning idea that's at the heart of any football-related collection, namely to lure customers into spending as much money as possible in order to complete a highly desirable set. And desirable it most certainly was. 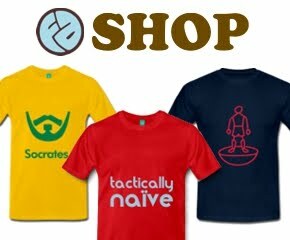 Like the England World Cup Coin Collection, the allure was to be found squarely in the shiny qualities that lay within. In fact you could say that Esso were way ahead of Panini on the shiny badge front and were the first to realise that a humble club insignia could be livened up with the application of a metallic sheen. 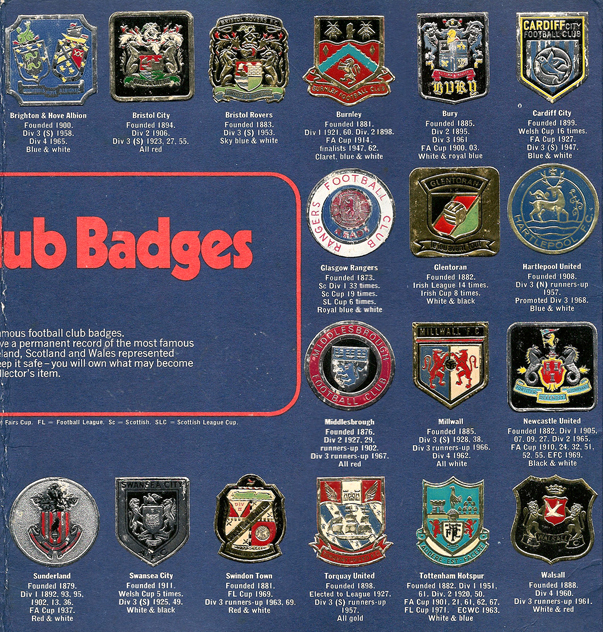 Curiously, this collection didn't feature all 92 badges for each of the English Football League clubs. Whether that was because of copyright issues, or whether some clubs just weren't deemed important enough we'll never know, but it was certainly admirable of Esso to include clubs such as Glentoran and Cowdenbeath to add an extra degree of interest. 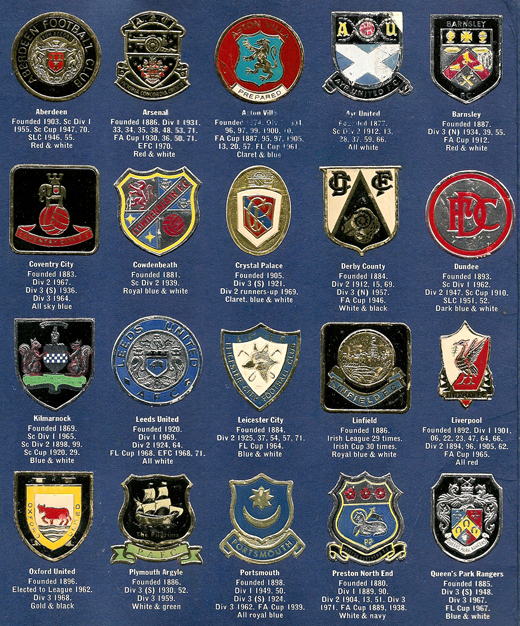 As you'd expect, many of the badges featured look somewhat different to the way we know them today. Some, such as those for Crystal Palace, QPR, Bolton and Hibernian are barely recognisable, but that's in a good way, not bad. It's incredibly important that such changes in graphical design are remembered for the ages, no matter how basic or quirky they may look, and this Esso collection does that in spades. 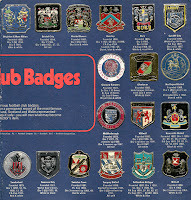 For anyone interested in having their own Esso Collection of Football Club Badges, there's good news. Many are still available to buy on eBay for a very inexpensive price and you'd do well to grab one. 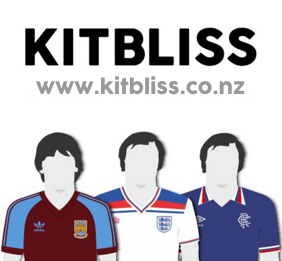 They're a fabulous addition to anyone's Football Attic. I'm guessing a few of these teams didn't grant permission to Esso or certainly, the company did their own unlicensed versions of their badges. I say this because Hull City have never at any stage used that particular badge on a shirt or on any of their branding. Probably the best Hull crest I've ever seen though. That Cardiff one also looks like an (excellent) Esso original. Great memories,thought it was before 1972. 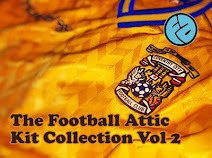 I seem to recall Huddersfield Town being the most difficult one to find and i had to wait ages to get it and complete the set. Excellent detail - thanks Tony! I wonder why Huddersfield's badge had such an air of exclusivity? 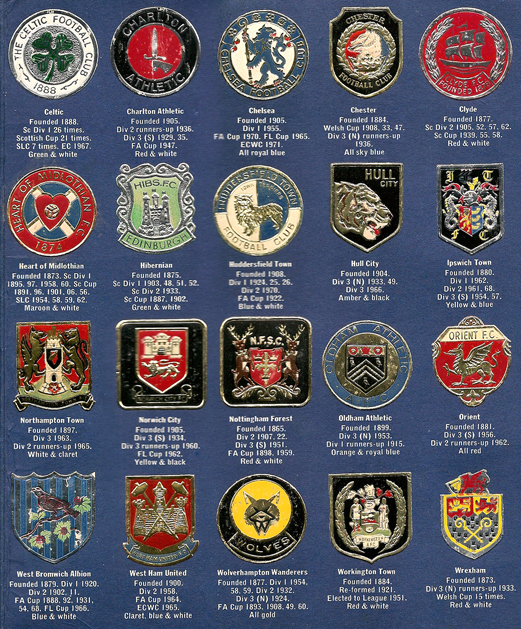 If you look at the selection of badges I think it was based on geography to get representation throughout the UK - and hence the inclusion of NI clubs. I suspect the 76 club limit was dictated by a marketing department. 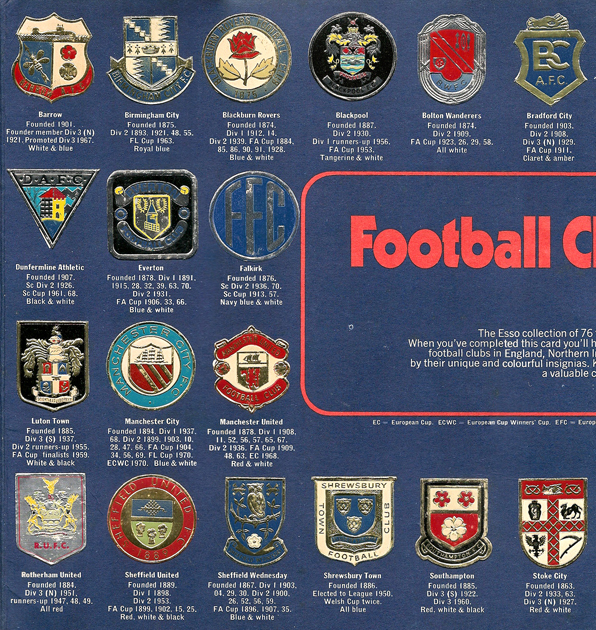 With regards the badges themselves in 1972 there were actually few definitive reference sources, in particular for lower division clubs - even the Rothmans yearbook appeared to have cribbed from the FL Review at least so far as my own club, Bradford CITY was concerned (please note distinction between Bradford City AFC and Bradford (PA) AFC - this website included). It doesn't take much for 'errors' to spread and people to assume that a sketch included in a comic was definitive. The Esso badges themselves assumed a status as being correct. With regards to the FA Cup coins, the Bradford City board was so impressed that a club stamp was made from the 1911 coin. I have one of these but live on Australia & the colors on the badges have faded is it worth anything??? ?